Griffin Office Solutions is a leading supplier of high quality office furniture (both new and used) and Used Herman Miller Aeron Chairs. We pride ourselves by supplying top quality products at competitive prices together with excellent customer service. Whether you need a desk, chair, storage or a whole building of workstations Griffin Office solutions will take care of your needs. Griffin Office Solutions, a privatly owned company, was established in 1995 by Dermot Griffin and has gone from strength to strength in the intervening years. In 2015, we established a parallel website selling the world renowned and iconic Herman Miller Aeron chair. These Used chairs provide optimum comfort at affordable prices. All our used office furniture and Herman Miller Aeron chairs are available to view and buy online. Delivery is available nationwide. Why not visit our websites to view our extensive range of office furniture and storage solutions. We supply quality used Herman Miller Aeron Chairs across Ireland. 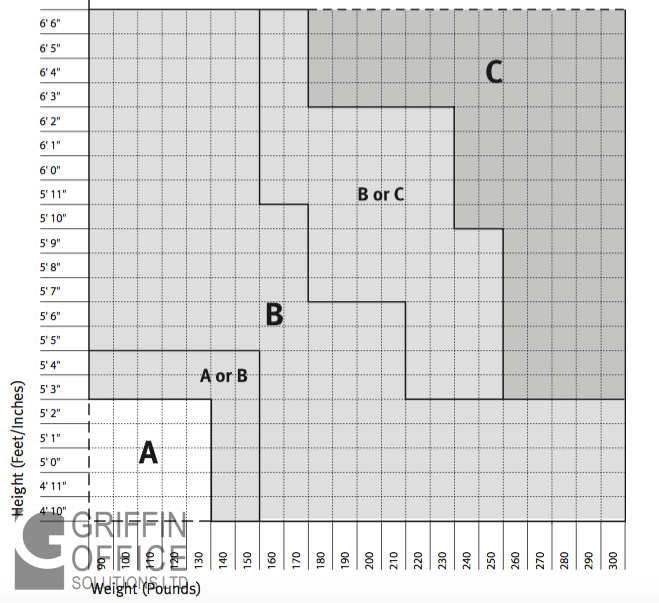 This reference helps people select A-, B-, or C-size chairs when the three sizes are not available for actual test sitting. Height and weight are key indicators of suitable chair-size choice. Since the B-size chair is designed to fit a broad range of people, Herman Miller recommends it for users who fall in the A/B or B/C category. This chart applies to Classic Aeron chairs with the extended-height-range pneumatic height- adjustment cylinder. To determine which chair size is best, find the point of intersection for your height and weight. Classic Aeron A-, B-, and C-size chairs are tested and warranted for use by persons 300 pounds and under. We personally guarantee that every chair we sell is of a perfect standard. No journey is too far, as we deliver nationwide. you office furniture but may also offer to act as DJ for your office party! The “engine” of the operation Deirdre has a handle on all aspects of the business. Despite her penchant for water her feet are firmly on the ground! and social media profiles. A teacher by day she has found a new love for IT! This latest addition to the company is efficient, resourceful and an excellent “fit”.